Sometimes you need a brushcutter, but it doesn’t make sense to have a separate piece of equipment. With Honda’s HHT35SUKA, you can have a single machine that is built for brushcutting and can be fitted with a trimmer head, making it an all-in-one machine. To fit these dual roles, it comes with a durable flex shaft and an efficient, high torque engine to give it the strength for serious cutting while still being small and light enough for frequent use. While Honda’s trimmers use a loop handle and a single strap harness, this brushcutter comes with a bike handle and a dual strap harness. This puts the weight of the machine on the operator’s shoulders, balancing the shaft so it takes minimal effort to swing the head back and forth when mowing. Since the throttle is located on the right grip, the operator can stand in a natural position. Together with a weight of just 16.1 lbs, this brushcutter is comfortable enough for all-day use. The HHT35SUKA is powered by Honda’s GX35 Mini 4-stroke. This brings several benefits over a two-stroke other than improved emissions and the ability to use straight gasoline. Two-strokes only make power near the top of their RPM range, while this engine’s torque curve is almost flat. This lets it power out of situations that would stall a two-stroke engine. Two-strokes push in fresh air and fuel while pushing out exhaust gases at the same time using the crankshaft. Inevitably, some fuel gets pushed out of the engine before it can be burned, resulting in high emissions and fuel consumption. The GX35’s intake is sealed when pushing out exhaust gases, resulting in emissions low enough to meet regulations across the U.S. while reducing fuel consumption by as much as 50%. This design also significantly reduces noise. This engine shares much of its design with Honda’s GC series. It uses an overhead cam driven by an internal timing belt built to last the lifetime of the engine. Ball bearings support the crankshaft, while the connecting rod rides on a roller bearing, reducing friction and vibration. There’s even an automatic decompression system, so it takes almost no effort to get the engine started. Best of all, the crankcase’s baffle system keeps the oil in place no matter what position the engine is in, and the rotary slinger keeps oil circulating as the engine is tilted. This means the UKA can be stored and used at any angle, just like a two-stroke powered brushcutter. This model comes with a blade barrier kit pre-installed to shield the operator from debris, set of safety glasses and a 10 inch, 80 tooth saw blade for cutting brush and wood. Honda also offers three, four and 8 tooth blades for lighter grass and weed cutting. The UKA comes with a Kwik Loader head. Instead of using a reel that can get tangled, this head takes pre-cut lengths of line that lock into the head automatically. The version used in this model is designed for Ultra Quiet line. 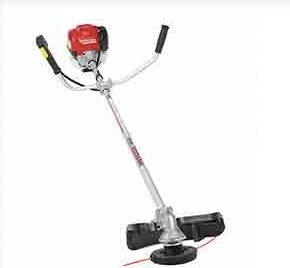 Together with the four-stroke engine, this makes this trimmer one of the quietest on the market. This head cuts a 17-inch swath. Honda also offers OEM alternatives to fit your preferred cutting style. The Pro-tap head has a button on the bottom that can be bumped against the ground to release more line. It’s designed to index one or two lines and can hold up to 20 feet of line on the spool. The Prolux Semi-matic spool is the standard head on Honda’s other trimmers. It has both an automatic and bump feed mechanism. The unused line can be removed by turning the center of the head. Like the Pro-tap it holds up to 20 feet of line. Other options including Prolux manual heads are also available. The HHT35SUKA and its engine are guaranteed for one year of commercial use or two years of residential use. The flex shaft is guaranteed by a limited lifetime warranty. Need to fix your Honda brushcutter? Looking to get a different trimmer head or a new blade? Visit www.hondalawnparts.com. We’re a certified Honda Power Equipment and Honda Engines dealer, letting us offer the full range of OEM parts from Honda and their manufacturing partners. Need help finding the right part? Once you select your model and serial number, our site can show you information direct from the factory including parts descriptions and exploded parts diagrams. We can ship whatever you need to any address in the U.S. or Canada.